Well, we have had plenty of those April showers, meaning plenty of time for kid crafts. 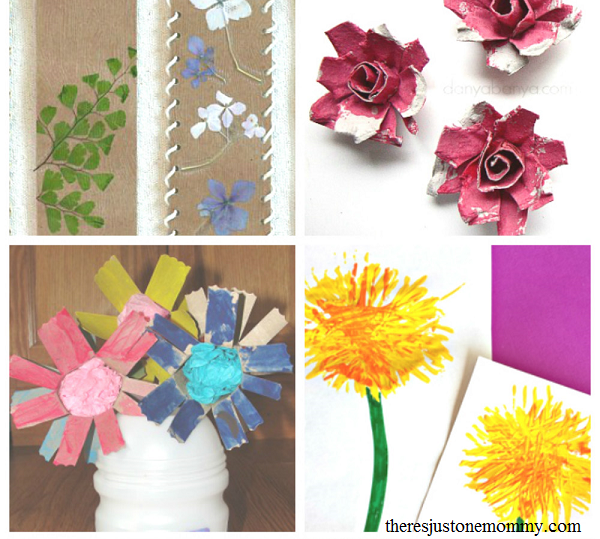 These flower crafts for kids are the perfect spring craft to welcome in the month of May. These flower crafts would make great homemade Mother’s Day gifts, too! Flower Stamping — Toddlers and preschoolers will have fun using some of those real spring blooms to create a colorful painting. Celery Flower Stamping — Little ones will have fun stamping these flowers using celery. Paper Straw Tulip — This 3-D flower is fun for kids to craft. Tulip Potato Printing — Continue printing flowers with this simple idea. Cupcake Liner Flower Magnet — This simple craft is perfect for the youngest crafter and makes a cute Mother’s Day gift. Flower Pens — This would be a fun craft for tweens to make as gifts. Bubble Paint Flowers — This simple bubble blowing craft makes absolutely gorgeous flowers. Soda Pop Tab Flower — This simple craft idea makes a cute card. Cardboard Tube Flower Bouquet — Recycle those cardboard tubes into a floral bouquet that will make a cute centerpiece. Pressed Flowers Bookmark — Preserve some of those blossoms with this beautiful homemade bookmark. It would make a lovely homemade Mother’s Day gift! Handprint Flower Bouquet — This handprint craft would be a sweet gift for a grandparent. Cardboard Tube and Tissue Paper Flowers — Here’s a unique way to use those cardboard tubes for crafting flowers. Egg Carton Bluebells — Why stick to your every day flower craft? These bluebells are so pretty you’d never guess they are made from egg cartons. Origami Flowers — Tweens will love learning how to fold colorful paper into amazing 3-D flowers. Sunflower Mask — Your child can become a favorite flower with this paper plate craft. Drop Ornaments — This ornament craft is simple enough for little ones and looks so gorgeous hanging up that you may find yourself creating a few, too. Fork Dandelions — These bright yellow painted dandelions remind me of chubby little fingers bringing priceless bouquets. Lollipop Flowers — Your child can make these lollipop flowers as a cute end of the school year gift for their friends. Paper Plate Flowers — These are so much fun! Your child will love getting creative while making these over-sized flowers. Blossom Fairy Lights — I absolutely adore this beautiful flower craft. It is perfect for little girls who love fairies. Egg Carton Rose — This is so pretty. You won’t believe these roses are made from egg cartons. Daisy Headband — We made this to go with one of our favorite Dr. Seuss books, but the flower headband would be perfect anytime of year. 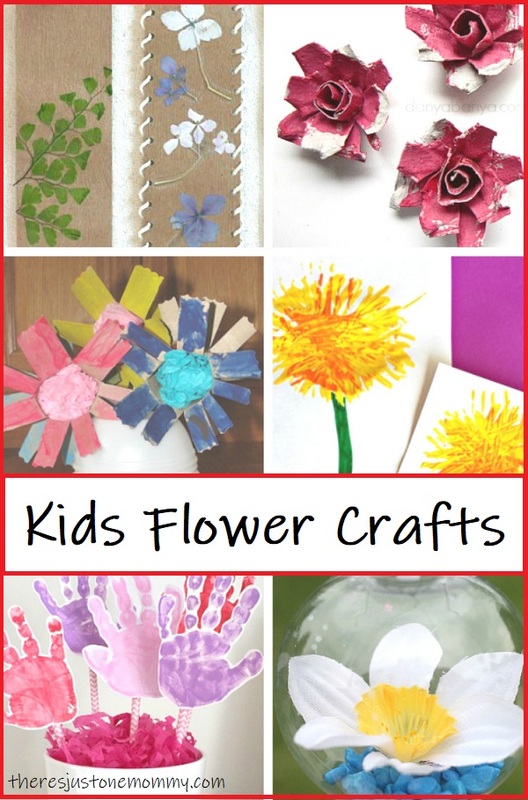 If you’re looking for a spring craft to do with your child this spring, these beautiful flower crafts for kids are sure to brighten up the house and leave those April showers behind. These flowers look absolutely stunning! What a fabulous round-up! Hi! I wanted to thank you for linking up with my No Rules Weekend Blog Party and to let you know that I have chosen your post as one of my Monday Special Features! I love those bookmarks! What a great list of crafts; just in time for Mother’s Day too. Beautiful ideas! Thank you so much for stopping by the Learn & Play Link up! This post is featured on Christian Montessori Network this week. These are lovely flower crafts. Thanks so much for sharing them at the Over the Moon Link Party.